The Yankees wrapped up an incredibly successful 18 games in 18 days stretch Sunday — yesterday’s off-day was well-earned, I’d say — and tonight they begin a three-game series against the Red Sox. It is way way way too early in the season to call this a big series, but you know both teams want to come out and make a statement. Gonna be fun. Anyway, I have some thoughts on the current state of Yankees’ affairs, so let’s get to ’em. 1. It is remarkable how quickly the Yankees as an organization have turned things around. Two years ago at this time their best young big league building blocks were Didi Gregorius (awesome), Starlin Castro (reclamation project), Luis Severino (pitched so poorly in 2016 he had to be sent to the minors), and Greg Bird (missed 2016 with shoulder surgery). Baseball America ranked the farm system 17th in baseball. The big league roster was built around veterans and the farm system wasn’t wowing anyone. Now the Yankees are loaded with young impact players, so much so that Gregorius is basically the elder statesman. Severino is a Cy Young caliber starter. Aaron Judge and Gary Sanchez are impact players. Gleyber Torres has been incredible in his limited time. Don’t overlook Jordan Montgomery either. The Yankees were unable to develop a cheap young starter like him from about 2006-14. There are still dudes like Justus Sheffield and Estevan Florial and Luis Medina in the farm system too. Other teams spend years near the bottom of the standings to get to this point. The Yankees did no such thing. Sure, their money gives them an advantage, but the player development has been exceptional and the decision-making has been damn near impeccable. It wasn’t long ago that it looked like the Yankees were heading for some down years. Now? I don’t think there’s another team in baseball set up better to win now and over the next five years. It is truly incredible how quickly things turned around and how healthy the Yankees are as an organization. 2. At 24-10, the Yankees currently have their best record through 34 games since the 2003 team started 25-9, and they have that great record because when they struggled earlier this year, they went 9-9. They didn’t go 6-12 or 5-13. They struggled on both sides of the ball — preventing runs was a bigger problem than scoring runs — but they still managed to tread water. Other World Series hopefuls like the Dodgers (4-9 at one point) and Nationals (11-16 at one point) dug themselves a hole and they’re still trying to get out of it. Remember when the Yankees spent the summer chasing .500 back in 2016? They didn’t get over .500 for good until August 10th because they got off to a brutal start — the Yankees were 8-16 at one point that year — and it took them all season to recover. When the Yankees stumbled out of the gate this year, they stumbled to .500, not below it. That’s huge. It’s huge because they didn’t dig a hole in the standings and it’s huge because it tells you that, even when everything seems to be going wrong, the Yankees still aren’t a pushover. 3. I’m having a hard time deciding what impresses me most about this 15-1 stretch. Maybe it’s the fact they’ve outscored their opponents 98-37, which is roughly four runs per game? Or maybe it’s that the one loss was a close 2-1 game that required one of the six best starts of Charlie Morton’s career? Or that they made Ken Giles punch himself in the face? Or that the Yankees have never once felt like they’re clicking on cylinders this season? Nah, my favorite thing about this 15-1 stretch is the hunger and the resiliency. The Yankees could’ve easily packed it in Sunday and said this isn’t our day, let’s enjoy the off-day tomorrow and get back it Tuesday. They could’ve had one foot on the plane to the West Coast in the series finale against the Twins. They could’ve folded after the Astros came back Thursday. But they didn’t. The Yankees came back every single time and they seem to truly believe they’re never out of a ballgame. The 15-1 record can lead you to believe it was easy, but it wasn’t, and there’s no quit here. These Yankees can take a punch. 4. 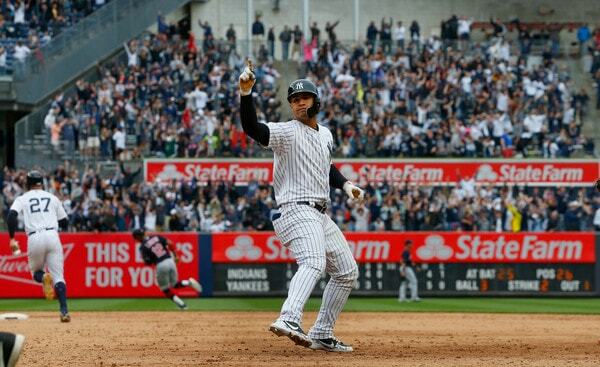 The last week has made it pretty clear to me the Yankees could use another left-handed power bat. Right now it’s Gregorius and that’s about it. All those power righties the Yankees faced over the last week — dudes like Morton, Justin Verlander, Lance McCullers Jr., Trevor Bauer, and Mike Clevinger — were able to miss bats and mostly keep the big right-handed bats like Judge, Sanchez, and Giancarlo Stanton in check. Adding a lefty power bat will help the Yankees combat those power righties and give them more lineup balance overall. 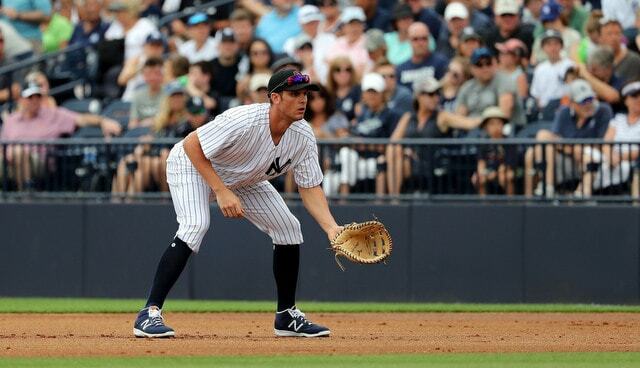 Fortunately Greg Bird is due back later this month — he was scheduled to play in his first Extended Spring Training game yesterday — and he can hopefully be that left-handed power bat. (The Yankees also have Adam Lind stashed in Triple-A as another option should Bird suffer a setback or something.) Hopefully Bird comes back soon and strong, and makes the lineup that much deeper and more dangerous. I mean, through Sunday the Yankees were already leading baseball in runs (197) and runs per game (5.79) even though Stanton is not yet hitting like an MVP candidate, Brett Gardner has been struggling, and Bird hasn’t played at all. As good as the Yankees have been, there is room for improvement, and it’s not “squint your eyes and these two guys could have career years” room for improvement. It’s “these dudes just need to get back to playing to their career norms” room for improvement. The Yankees could use another lefty bat though. I thought last week made it very obvious. Hopefully Bird can be that lefty bat. 5. It took a little longer than we all hoped, but Neil Walker is finally starting to contribute. He had some pretty good swings during the Angels series — Kole Calhoun robbed Walker of a home run at the scoreboard, remember — and, over his last four games, Walker is 4-for-10 with six walks and one strikeout. He’s been in the middle of pretty much every big inning too. Walker’s overall numbers are still terrible — he’s currently hitting .189/.282/.222 (41 wRC+) — but I don’t think the guy forgot how to hit over the winter, and it’s not like he’s so old (32) that his skills suddenly eroding was to be expected. He had an abbreviated Spring Training and he’s had to adjust to a new team and a new league and all that, and Tyler Austin played so well the first few weeks that Walker wasn’t always in the lineup. He’s starting to come around now though, and until Greg Bird returns, I imagine Walker will be at first base against righties. And if he doesn’t continue to turn things around, the Yankees will move on some point. I’d bet on them holding on to Walker long enough to include him in a larger trade as a way to offset salary — similar to what they did with Tyler Clippard last year — rather than outright cutting him. I don’t think it’ll come to that though. 6. When a highly regarded young player hits as well as Gleyber has so far — Torres owns a .327/.357/.500 (127 wRC+) batting line 15 games into his big league career — it’s easy to want him moved up in the lineup. Bat him sixth or seventh, whatever, but get him more at-bats than he’s getting right now. I actually like having Torres batting in the ninth spot and serving as the proverbial second leadoff hitter. It’s more men on base for the top of the lineup and besides, Gleyber has been in the show for two weeks. I don’t think there’s anything wrong with leaving him in the No. 9 spot for a while as he goes through his ups and down. Derek Jeter started 77 of 157 games as the No. 9 hitter in 1996 and another 18 as the No. 8 hitter, and everything worked out just fine. Besides, the Yankees aren’t desperate for offense right now. The lineup is fairly circular and it’s not like they need Judge and Stanton and Sanchez to hit in order to win. They won Saturday with Sanchez (and Gregorius) out of the lineup and Judge and Stanton going a combined 0-for-8 with five strikeouts. There’s plenty of firepower on the roster. Gleyber’s been awesome. For now, I say leave him in the No. 9 spot and let him be that second leadoff hitter. We can reevaluate things in a few weeks. 7. This is going to be worth a full post at some point down the road but it’s worth mentioning now: Now that Sheffield has been promoted to Triple-A Scranton — his first Triple-A start didn’t go so well over the weekend, but it was only his first start — it’s time to consider him a potential call-up option. Once you’re in Triple-A, you’re available to the big league team. I’m certain the Yankees still have developmental goals in mind for Sheffield — fastball command and cutting the 13.4% walk rate are presumably chief among them — and I don’t think the Yankees want to call him up until he reaches those goals, but if push comes to shove and they need an arm, I think Sheffield is in play. And hey, maybe they’ll need him as a reliever, not as a starter. There is going to be an innings limit to navigate — he’s thrown between 118.1 and 127.2 innings each year from 2015-17 — and chances are Sheffield won’t develop command overnight, so he might not be ready to start at the MLB level before the end of the season. He is in Triple-A now though, and once you reach that level, you’re a big league option. As fun as it would be to see another top prospect reach the show this year, when the time comes, I hope the Yankees call Sheffield up because they want to call him up and not because they’re short an arm and have to call him up, you know? 8. Can’t wait for Tommy Kahnle and Adam Warren to come back, you guys. Kahnle’s going to throw a bullpen session later this week and it sounds like he’s roughly two weeks away from rejoining the Yankees. Warren is a little further behind. The bullpen has been mostly fine these last few weeks, but David Hale and A.J. Cole never pitch, and Jonathan Holder still hasn’t shown he’s trustworthy even in medium leverage spots. Swapping out two of those dudes for Kahnle and Warren will be pretty huge. Also, neither guy was automatic before going on the disabled list, so the sooner Kahnle and Warren come back, the sooner the Yankees will get a chance to evaluate them, and the sooner they can determine whether they need to go out and get a reliever at the trade deadline. Having to trade for a reliever after all the “greatest bullpen ever!” stuff before the season would be kinda lame, but baseball can be a jerk sometimes. Guys like Brad Hand and Kelvin Herrera — great relievers on terrible teams — would be atop the trade target list. Ideally, Kahnle and Warren come back and are effective, and add length to the bullpen. You know the Yankees are going to need that bullpen heavily down the stretch and potentially into the postseason.